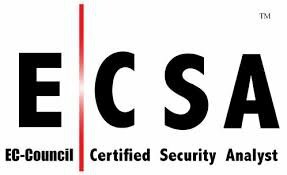 EC Council Certified Security Analyst, ECSA an advanced ethical hacking training certification that complements the Certified Ethical Hacker, CEH certification by exploring the analytical phase of ethical hacking. While the Certified Ethical Hacker certification exposes the learner to hacking tools and technologies, the Certified Security Analyst course takes it a step further by exploring how to analyze the outcome from these tools and technologies. Through groundbreaking network penetration testing training methods and techniques, this pen testing computer security certification helps students perform the intensive assessments required to effectively identify and mitigate risks to the information security of the infrastructure. This makes the Certified Security Analyst "Pen Testing" certification a relevant milestone toward achieving EC Council’s Licensed penetration Tester, which also ingrains the learner in the business aspect of network penetration testing. The Licensed Penetration Tester certification standardizes the knowledge base for network penetration testing professionals by incorporating the best practices followed by experienced experts in the field. The objective of Certified Security Analyst “pen testing” certification is to add value to experienced Information security professionals by providing data security training that will help them analyze the outcomes of their Vulnerability Assessments. Network Penetration Testing Training leads the learner into the advanced stages of ethical hacking.